I hope everyone can get some use out of the Friends words (14 languages, 12 styles, 1 meaning) below for NSD. Thanks to those that took the time to leave a comment. Well today we have been making some things to make my son’s soccer scrapbook. 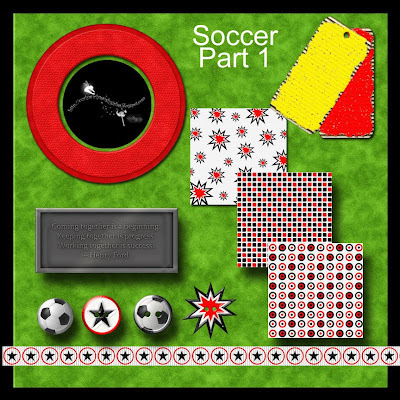 I am calling this part 1 because my son really wants to make a dedicated scrapbook for his soccer. I am finding that this is actually a good process for him, not only artistically but in terms of your basic maths skills of pattern making. I downloaded the fantastic pattern template from Rachael Scutt’s shop today and also purchased some of her other CU pattern templates. The paper’s we made were by trying patterns. Am I doing well here – you can now tell your husband that you are not spending all that time scrapping – you are educating your children LOL. So this initial instalment – I am making no promises on when the next instalment will be we are relying on the whim of a 7 year old boy . We made some lovely green grass background – more astro turf than natural LOL -, some patterned papers in our team colours, ribbon, buttons, a brad, the yellow and red card and a quote. The red leather frame is totally scrap-lifted from the square ones Pam did for Jump a while back. It would be fair to say that I totally love the leather tool from Atomic Cupcake or maybe it is reading all about Vicki’s BBQ success of late in Texas that has me thinking leather. Anyway the file sizes were a bit big on this so I split them into the papers and the elements. If you are downloading please take the time to say hello, I read all the comments and there are some names who are becoming very familiar and whose cheery greeting or thank you always puts a smile on my face. thanks a bunch for the soccer stuff. My 7 yr old granddaughter is very much into soccer so these will surely come in handy. I just wanted to say thank you fro the soccer stuff and the fruity buttons! my roommate is Hawaiian and loves anything pineapple! I'm very excited to use it on a page of me and her! Also, THANK YOU SOOO MUCH for the Portuguese "friend" elements! I am 1/4 Portuguese, and have taken the language for 4 semesters now.. I also have studied abroad in Portugal, so anything Portuguese, I absolutely LOVE! I adore your designs! keep up the great work! Thanks again! Wow, what a cute kit! I didn't snag it but would if I had a wee one in soccer! It's fabulous!!! I need to know how to "inherit" a grandson or granddaughter who plays the sport, hehe. ANYway... I stopped by through a link on Vicki's blog (isn't she fab?!) at A Work In Progress and wanted to say HELLO!!! Have a great weekend! I lose my voice every weekend from cheering on my daughter's soccer team. LOVE that game & your scraps. Thank you for another awesome kit. Thank you for another great kit. My kids play soccer and this year started referring. This kit will surely be a hit for their pages.